WHY INCLUDE PATIENT EDUCATION IN MY PRACTICE? Show your patient the tutorials for procedures that are included in his treatment plan. Answer your patient's follow-up questions, ease discomfort, and address doubts. The DVD may be looped to show all the videos, one after another. Save time in the operatory. 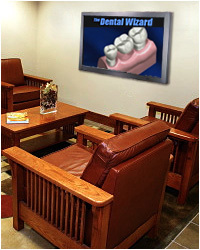 Show your patient the tutorial in reception, then answer his follow-up questions in the chair. 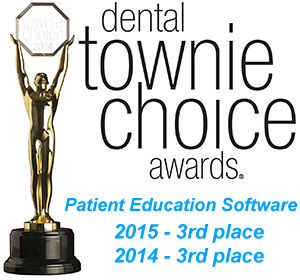 The Dental Wizard® is also a passive marketing tool for your practice: the 3D animated tutorials explain dental procedures clearly, consistently, and in nontechnical language. The videos help your patients understand and accept your suggested treatment plan. You don't have to "sell" your patients on what they need — The Dental Wizard® targeted tutorials do that for you. These compelling presentations enhance the professionalism of your practice, save you and your staff's time, and standardize the information you want your patients to receive so they can provide informed consent. The Dental Wizard® is available in English and Spanish on DVD-R, on your practice server, and on the Web-link, online delivery through your practice web site. Use this unique opportunity to try the Dentist Wizard® in your practice and observe your patients' responses — under real working conditions — for a full week. The Dental Wizard® does not replace the communication between doctor and patient — instead, communciation is enhanced because the patient will then be comfortable asking follow-up questions. ©2002- DigiDentist®. All rights reserved. 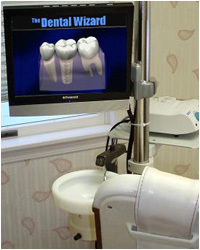 of this web site or the DENTAL WIZARD® is strictly prohibited by law.